One of the biggest hurdles to Seattle’s dealing with its homelessness emergency hasn’t been money or ideas. It’s figuring out the right mix of compassion and enforcement. Take last year’s ill-fated proposal to allow camping in parts of the city’s park system. The motivation was compassion. But other cities that experimented with legalizing camping saw, not surprisingly, a boom in camping everywhere — both sanctioned and otherwise. We’re about to enter the latest phase of this conundrum, only now involving a button at least as hot as parks. And that’s street parking. 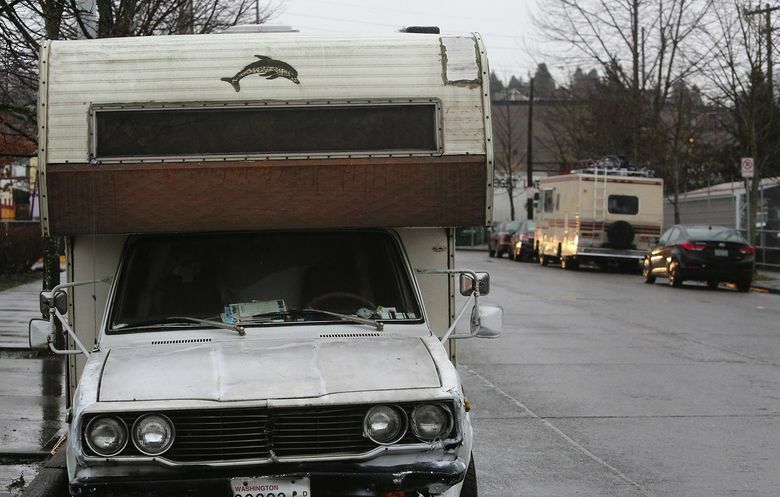 A draft ordinance circulating around Seattle City Hall this week seeks to get at the explosion of car-camping in the city. Only it does so by compassionately allowing car-camping. A chronic problem for car campers is that their rolling homes tend to rack up tickets they can’t afford. If this leads to towing, booting or impounding, then they’ve just been pushed closer to a more severe stage of homelessness. One obvious answer could be to give car campers lots to park in at night. We’ve been talking about this for a dozen years and, in the city anyway, have maddeningly failed to make it work. So what the proposed ordinance would do is make car-campers effectively immune to tickets, booting or impounding. “A vehicle identified as a vehicular residence is diverted from incurring any penalties … if the user or users are participants of the Vehicular Residence Program,” the ordinance states. To get into this program, you just have to be living in your car. Any sign of that, such as covered windows or a car filled with stuff, qualifies. These diversions from penalties would apply to parking at expired meters, parking more than 72 hours, parking a junked vehicle, plus a whole range of other infractions. The ordinance as written suggests that if you’re living in your car, you could effectively car-camp anywhere. Now Bill Kirlin-Hackett, a Lutheran reverend whom I admire for his tireless efforts at helping the homeless, said the spirit of the ordinance, at least, isn’t to allow car-campers to set up all over. It’s to help get them off the streets before they’re crippled by traffic enforcements. “If what you’re using as your home gets impounded, then the city’s homelessness problem just got worse, not better,” he says. That’s true. But the tension is that if the government stands down from enforcing parking laws on car-campers completely, then what is the likely result? Car-camping everywhere. Kirlin-Hackett, director of the Interfaith Task Force on Homelessness, said the crucial piece of this puzzle is that Seattle has to set up more places for the homeless to park legally. And also, ultimately, build more homeless housing to get them out of their cars entirely. I agree. That way, when police identify someone living in a van parked illegally, they could say: “You can’t stay here; you’ll get a ticket. But you can park for the night at the safe lot across the way.” That would be compassion, too, only not the blanket kind. I’ve written a number of times about how the city of Santa Barbara 13 years ago set up a system where people can park overnight in two dozen lots. There are a lot of annoying rules. No more than five cars per lot. You must leave in the morning. You can’t car-camp on the street. Yet that small city somehow has provided dispersed, controversy-free parking spots for 115 car campers a night at a cost of only $22,500 per month. Here? A single 20-vehicle lot in Ballard was nine times more expensive than that, per vehicle. It was so pricey the city shuttered it last summer. Kirlin-Hackett said there is talk of Seattle trying safe lots again, with a proposal for 30 to 50 small ones around the city, in partnership with churches and businesses. And maybe a little less compassion, as strange as that may sound.